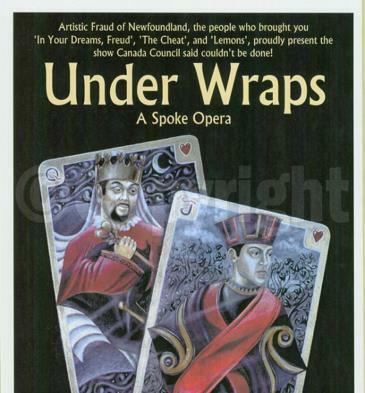 A gay fantasia about unrequited lust written by Governor General’s Award-nominated playwright Robert Chafe, the basic design of Under Wraps has two actors on top of a 40’ x 60’ white parachute cloth, with eighteen brave actors underneath the cloth creating the set. The actors under the cloth were strictly choreographed to arrive and position themselves on precisely marked areas on the stage using a grid system. The two actors on top of the sheet are harmonized with the blocking of the actors under the cloth. Under Wraps is one of the earliest examples of Siminovitch Award-winning director Jillian Keiley’s “Kaleidography” approach to composition and performance.